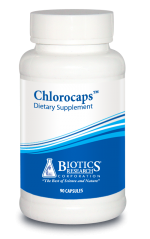 Chlorocaps supplies both water and lipid-soluble chlorophyllins, along with lipid soluble vitamins, and SOD and catalase, which function as important antioxidant enzymes. Chlorophyll has been called the “blood” of the plant world, and has the same structure as the heme of blood (except that where the heme carries an iron mineral in the center, the chlorophyll carries magnesium). Thus it may be beneficial in supporting blood quality, and it is a good source of magnesium.